(1) In General. After giving public notice and an opportunity for comment, a district court, acting by a majority of its district judges, may adopt and amend rules governing its practice. A local rule must be consistent with—but not duplicate—federal statutes and rules adopted under 28 U.S.C. §§2072 and 2075, and must conform to any uniform numbering system prescribed by the Judicial Conference of the United States. A local rule takes effect on the date specified by the district court and remains in effect unless amended by the court or abrogated by the judicial council of the circuit. 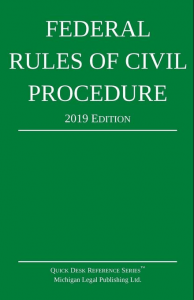 Copies of rules and amendments must, on their adoption, be furnished to the judicial council and the Administrative Office of the United States Courts and be made available to the public. (2) Requirement of Form. A local rule imposing a requirement of form must not be enforced in a way that causes a party to lose any right because of a nonwillful failure to comply. (b) Procedure When There Is No Controlling Law. A judge may regulate practice in any manner consistent with federal law, rules adopted under 28 U.S.C. §§2072 and 2075, and the district’s local rules. No sanction or other disadvantage may be imposed for noncompliance with any requirement not in federal law, federal rules, or the local rules unless the alleged violator has been furnished in the particular case with actual notice of the requirement.